Supported evidence-based nutrition education curricula in 170 classrooms for more than 1,970 class sessions. Supported the building, re-invigoration or maintenance of 8 school and 2 community gardens. 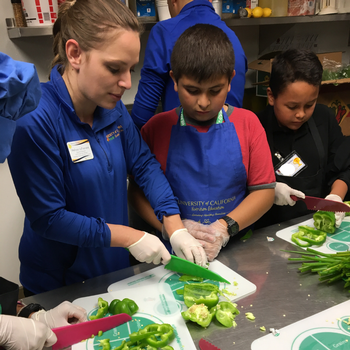 Provided positive youth development programming and leadership skills with 97 4-H Student Nutrition Advisory Council (SNAC) youth. 69% of teachers report that, compared to the beginning of the year, they now remind families to bring healthy snacks for school parties. 78% of youth leaders report that they believe they can help make their school a healthier place. Provided direct nutrition education services to 10,300 youth and 1,300 adults. Partnered with 163 Educator Extenders to provide 2300 hours of nutrition and physical activity education. Facilitated 66 student leaders trained in cooking, nutrition, leadership, and presentation skills.